Getting value from digitisation is proving harder than many of us thought, but it is quietly transforming our business. There are interesting opportunities around machine learning, working with satellite imagery, helping smaller E+P's get digitally enabled, better analytics on data to improve fraccing, and getting faster warning of developing risks. 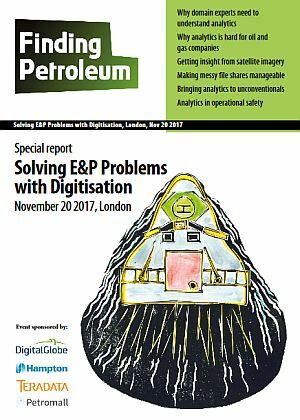 Consider for example the advocacy of the CEO and CTO of EOG Resources, a well-respected US shale player, and the Group/Upstream CEOs of BP – they are all affirming that ”digitization” is transforming their business, and that there is a lot more to come. Perhaps it is worth saying that at the highest level, the “E&P problem” is how to run a profitable oil & gas business with oil prices stabilized (we hope) at say $50/barrel. provided the business objective has been clearly and carefully defined. What do we mean by “digitization” – how about data management in the ‘cloud’, data engineering, analytics, machine learning? And does the typical oil & gas company contain the skills to deliver the promise? Or are they going to become dependent on GE or Schlumberger? I guess we would all have our opinions on whether that was a good idea!! Duncan Irving is the Oil & Gas Consulting Team Lead, EMEA & APAC with Teradata. Duncan joined Teradata from the University of Manchester where he instructed in geophysical interpretation and geocomputational methods for the last seven years. He was involved in consulting and research projects involving user interactions with massive subsurface datasets and more general upstream data management, and he continues to maintain research links as an honorary lecturer. One long term project was with Teradata and he drove the development of Teradata's capabilities in the Upstream Oil and Gas area. This time provided him with a deep understanding of the capabilities of Teradata and how they can best be used in the petroleum industry. He is a geophysicist and also has a PhD in glacial geophysics and geotechnical engineering (why frozen ground moves faster during climate warming and how this affects infrastructure). Duncan lives in the hills outside Manchester with his wife and three children. He is a mountaineer, fell runner and is a card-carrying member of the CAMpaign for Real Ale. The ability to rapidly analyze large amounts of data together with the increase in data availability are bringing new users and creating innovative geospatial applications. Thanks to the power of the cloud, extensive experience in image processing and innovative machine learning approaches, users can now extract information at scale from geospatial data. This presentation will focus on the benefits of the combination of satellite imagery and advanced geospatial analytics which enables E&P professionals to access over 100 Petabytes of high resolution-imagery and analyse them through DigitalGlobe’s Geospatial Big Data platform. Over 28 years business background and technical experience in Information Technology, relating to energy business processes. Have identified problems and implemented effective and innovative integrated content and platform solutions to address financial and strategic analysis and business model recommendations. Worked globally with companies such as Total, Eni, Shell, BP, Statoil, ExxonMobil and ChevronTexaco. Have lived in Europe for the last 19 years, working for various technology companies. BA in Geophysical Sciences from Univ of Chicago, MS in Geology from Univ of So. Carolina and MBA from Houston Baptist University. There seems to be a relatively sudden and growing realisation that the two criteria that have been used in the past to drive value in a shale player - having plenty of acreage in the right basin and then in the "sweet spot" - are no longer enough; performance is now important, paramount. At its simplest, performance is driven by 1) Where you drill and 2) How you drill/complete/frack. As a completely subjective observation by me, I would say the big weakness in US shalers = Where in the rocks you put the well; the strengths are in design and execution of the completion/frack = How. However, as I will illustrate, advanced analytics allow us to work our way through very large amounts of data and address the Where and the How! He joined the board of Premier Oil in May 2014. What can we learn from CRINE? "The talks and debate at coffee."